The company has extensive experience in over-molding and plastics with metal inserts, which are placed either manually or automatically into a mold which is then injected with the polymer. All types of plastic materials are used: pp, pa, ps, pc – always with the highest quality. 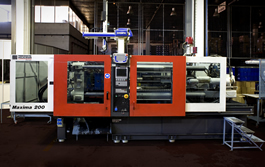 The latest technology is also used for plastic injection, utilizing units of various capacities with both vertical and horizontal enclosures. 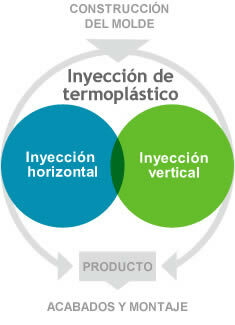 Dispone de inyectoras de plástico de última tecnología, de variadas capacidades y unidades de cierre verticales y horizontales. In addition to plastic injection, Termotec offers additional services such as building service injection mold parts from client drawings within set deadlines and with any consequent adaptations and modifications. 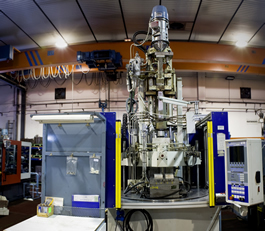 The size of the mold depends on the size of the part to be injected as well as its weight and the size of the plates of the press where it will be injected. Termotec also provides product finishing services such as painting, silk screening, chrome plating, machining and assemblies of varying complexity – providing expert craftwork and the highest professionalism with all services.